Today is one of my favorite days to celebrate: It’s Lylee and Enzo’s Gotcha-Day! If you’ve been around for a while you might know that we (accidentally) got Ly and Enzo on the same day, one year apart. Even if you are new around here, chances are you’ve picked up on the fact that we absolutely adore our kids dogs kids. Here’s more detail on Lylee, Enzo, and their adoptions. 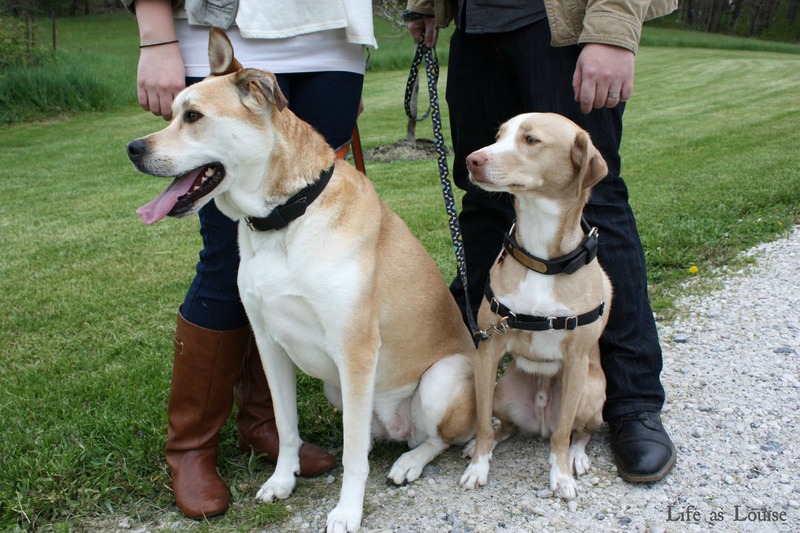 Ly is a husky/boxer mix (I think she looks like a Carolina Dog, though). We adopted her four years ago today from a friend and she was already a year and a half old. I 100% remember that night. K and I drove an hour north separately because she came with a doghouse that needed hauled home in his truck. I put her in my backseat and she fell asleep less than 15 minutes into our drive. It was raining and stormy, but she seemed so content in my car. She lived with me at my parents’ house until we got married and bought a house. We started looking for dog #2 a few months after we bought the house. Ly was starting to develop a sever social anxiety with dogs and I was relentless about getting a puppy. We knew we needed a young, submissive, male dog. K wanted something “tough” looking- like a boxer or a pit. I was indifferent. Then we set eyes on Enzo. After meeting a few other dogs we knew Enzo was the one. 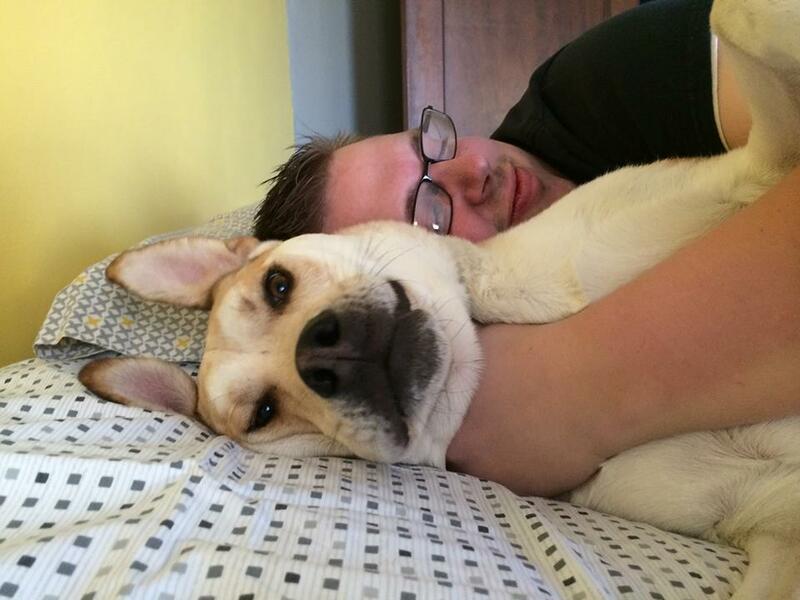 When Lylee happily accepted him into the home there was no going back. I almost die every time I see his puppy pictures. He’s the cutest. Similar to how one dog isn’t for some people, I will admit that two dogs aren’t a good idea for everyone. That said, I doubt we’ll ever be a one-dog-family again. I love our duo. I love that while one dog cuddles with K the other one seeks attention from me. I love that Lylee was +2 years old when Enzo came into our lives and she taught him 80% of the rules just by example. It made training SO much easier. I love the relationship between the two dogs. I love that Ly eases up during tug-o-war with Enzo (verses giving it her all when playing with K). I love how Enzo licks Ly’s face in a gesture of respect and adoration. I love how they greet one another when they’ve been separated for a period of time. I love that Ly lets Enzo sit on her back and Enzo lets Lylee rest her head on him. I love that Lylee comes running if Enzo yelps in pain or whines in distress. I love that Enzo has the lowest growl I’ve ever heard… while Lylee “talks” just like all those huskies in viral internet videos. 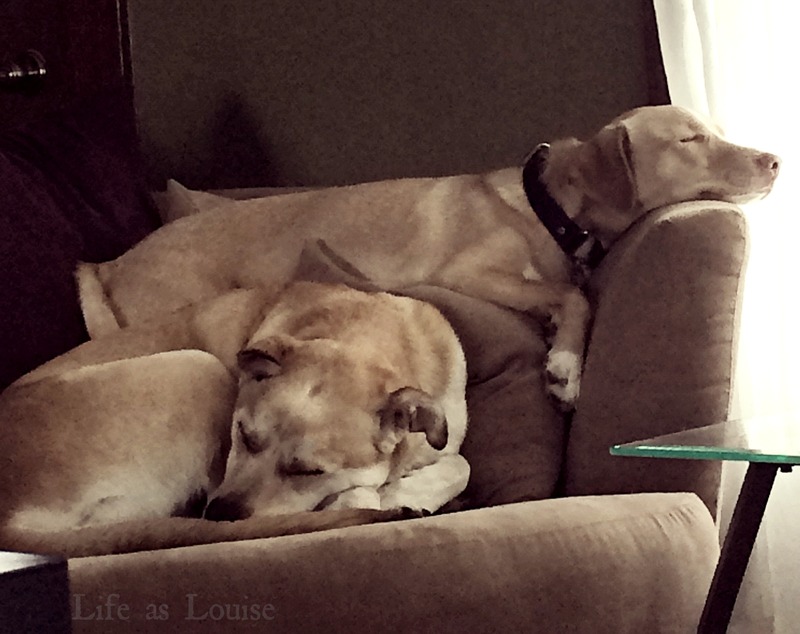 I love that on their own our dogs are good listeners and perfect angels… and when they’re together they are monsters. Haha. That sounds messed up, but they’re siblings and they feed off one another’s energy- which is so perfect. I love that Enzo’s personality mirrors K but he’s more bonded to me and Ly’s personality is closer to mine but she adores K.
If you’re happy as a lark with one dog then I think that’s fantastic. Do you have a dog(s)? What’s your favorite part about having multiples? No dogs for me but one day it’ll happen. I’m not sure I’d be a two dog person but who knows, If it were the right time, I’m sure I wouldn’t say no. My parents had/have two dogs for most of my life, but with Hawkeye we’re a one dog household! I would get a 2nd but Hawkeye is for sure an only child. She doesn’t like to share me or John and now that she’s almost 8, there’s no need to upset her world. Happy adoption day, little fluff nuggets!! Oh yeah. If Ly hadn’t accepted Enz we couldn’t have kept him- neither dog would’ve been happy. I grew up with one dog (and K did, too) so it was the opposite for us! They are adorable. I love the chair photo of them. Gus and Geege are best friends. They tolerate Mae but their bond is crazy. Lol- at least they tolerate her 😉 We have plenty of seating but Enzo always tries to snuggle up on top of Lylee. Haha. I love having multiple dogs… I want another SOOOO badly! If we could find another Aussie puppy, I’d take her in a heartbeat!!! I always say I want at least 3 dogs (I want more… loved having 4) because when we get to the time to loose one (cue tears) I never want to go home to a empty home. EVER. OHHH – dont puppy pictures just take you back. They’re so small for such a short time. SO CUTE!!! we dont have a dog yet (soon) but i do love looking at dog pictures! I love LyLee and Enzo! They are adorable and have the best names. And what I love the most is how absolutely adored those two special doggies are. It always warms my heart when I see animals so deeply loved and cherished as I wish all animals were. While cats are my spirit animal, I still like doggies and I love their personalities, deep loyalty and big doggie smiles. The picture with Enzo as puppy is just too cute for words. Happy Adoption Day to LyLee and Enzo! I love this! Happy adoption day! We’ve been talking about getting Mavis a friend now that she’s two, but are probably going to wait until she’s a bit closer to three since there is a lot of change happening in our family before then with a move, new house, etc. This post makes me so hopeful for the friend we’ll add someday (hopefully soon!). I am SO glad we got Ly a brother- I honestly think it’s one of the best things we’ve ever done for her. They love one another so much 🙂 I hope a new fur baby joins you guys soon, too! Oh my gosh, our dogs are the exact same!!! Flora is bonded more to Michael but she’s more like me, and Tully is more bonded to me but she’s more like Michael! Jenn from Optimization Actually wrote a post about that once! I love having two dogs because the play together and it’s so fun to see! But ours do have their testy moments. I don’t think I could have more than two dogs (unless we had a bigger house/yard) but I don’t think we’ll have just one ever! I’ve heard horror stories of dogs turning on one another but I’ve never seen it in ours. Sometimes Ly gets a little too hyper and pounces on Enzo, but the second he squeals (or I scold her) she settles. aw we got MIllie and Chelsea on the same day a year apart too!! twins! kind of! haha. i don’t have dogs (can we still be friends? i have a dog back home in Oz) but getting a 2nd cat was the best thing we ever did for our 1st cat. when we got our 3rd, i begged KC to let me get 3&4 at the same time but he put his foot down. huge mistake and one we are still paying for really. he mentioned getting a 4th cat the other day and i was like no. i can’t do it again. plus Millie is 2 years old, not a kitten anymore. but anyway. multiples are always better! Hahaha! Did you mean to? We didn’t, but this year on the 7th K was like, “If we get a third one we have to get it today.” He was kidding, though. I’m not allowed to get a 3rd (yet…..). I will still accept you for cat person you are 😉 I actually have a cat that lives at home with my parents. She’s an old lady and she wouldn’t jive with Ly, so she lives with them. I LOVE having multiples. The dogs love it, too. Enzo is SO bonded to Lylee- it’s ridiculous. It’s so cute how they get along so well!!! (Despite the mischief causing 😉 ). And how cool that training Enzo was easier because Lylee taught him the rules! When I realize he was copying her movements I almost squealed! He honestly lives to please me. (Ly is a different story… She lives to please herself. Ha.) If he did something good and I gave him a treat he’d usually ignore the treat and nuzzle into my hand for petting and attention. Lylee not so much- she’s treat driven. I was so amazing by his copying, though! Ahh, such cuties!! I do like hearing about other people pets. I feel like we could handle one dog, but two might be a bit too much haha. Although, I think if we do get one in the future, I can see us adding another. I’d like to adopt another dog that is many deaf/blind or has some other problems after I’ve got the skills in place to manage a dog. That sounds responsible, I think. This makes my heart so happy! Happy gotcha day, pups! Here’s to hoping I have a future dog that resembles a fox like Gatsby! Your babies are just the sweetest — so, so cute. I wanted a second dog for the longest time, and while we love our Bully (our second)… man, is it a lot of work. We were told that Bully was submissive so that’s why we added him, but it has turned out not to be true at all. Oy! We just love them both though! It’s tough when you’re expecting one thing and get another… But good on you guys for stick with him and loving on him regardless! We really, really thought we’d be bringing home a male boxer mix that day in 2013…. Man- Enzo has proven to be the total opposite! Ha! Haha, thanks, Audrey. 😉 I’m going to show this to my hubby. 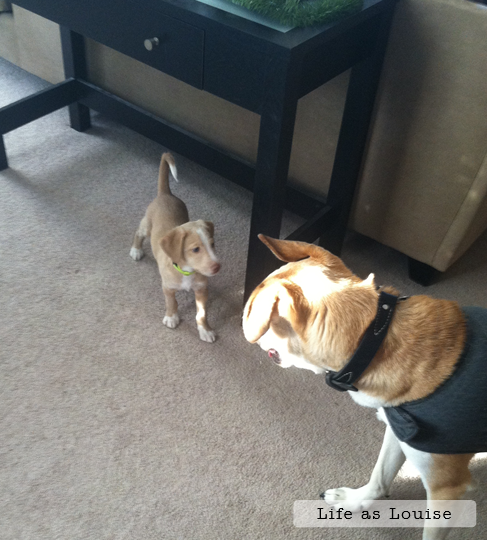 I love that you said Lylee taught Enzo what’s up. I think Skyler would totally teach a new dog if we get one! It amazed me that he would watch her go outside, potty, and then come inside and sit for a treat. He picked up on it almost immediately. Aww their birthday is our wedding anniversary! I guess I shall remember this every time, too! Really?? Nice! A December wedding! Your caption about Enzo as a puppy is too true. He is beyond cute! I love how you described their relationship and the photos you shared. As you know, I have two sisters, the destructive duo. Although Neil is convinced that if we had only one of them, they would be much better behaved because they feed off each other’s mischievous ways…we still wouldn’t have changed our minds about getting the both of them. They love each other SO much. I get teary just thinking that one day (in a very, very long time) that one will go before the other. I can’t take it. Happy adoption day to Ly and Enz! He gives me cute rage. He still does… but those puppy pictures… damn.